Husband’s birthday was this past week. I won’t say how old he is, other than to say he’s not old. Because that’s what he says and it sounds good to me. He’s not the easiest man to buy for, but then are any men easy to buy for? The problem with Husband is that when he wants something, he buys it. Let me clarify that: When he wants something, he analyzes all his options, pours over ads, visits several websites, compares countless consumer ratings, visits store after store, until finally he makes his selection and goes in for the kill. So for me to buy something he’s wanting would be kind of cruel, don’t you think? I mean, the hunt is probably 90% of the fun. I wasn’t sure what to do. 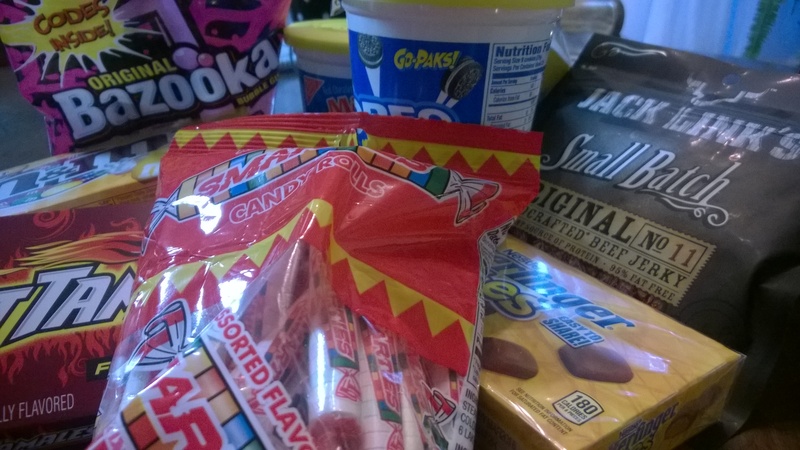 I cruised the aisles of Target, looking for items he liked, and finally starting filling my tote basket with all the treats, goodies and snacks he enjoys, but never gets because when you get a certain age … not old, mind you … but a certain age, you try to eat more healthfully. And there was nary a healthy thing in this basket. He was a big man, recent transplant from Chicago (I heard him say it to the customer ahead of me). Remember my post from last Saturday and the man with the red wagon? Well, this guy was taller and bigger than that guy. And getting real enthused about my purchase. Yes, they still make Animal Crackers. And they still put them in a little box with a handle. I just made that guy’s day. I told him what aisle he could find them. His plan was to pick up several, relax in his “man cave” and eat them during the game. Ah, those delightful snacks from our childhood — always sure to bring a smile. What was your favorite? I was (and still am) smitted by Starburst. I was so excited thinking about Starburst that I wrote “smitted” instead of “smitten.” Yikes. Ha! I rather like smitted though, and it makes sense grammatically speaking: smit, smitten, smitted …. It totally works! 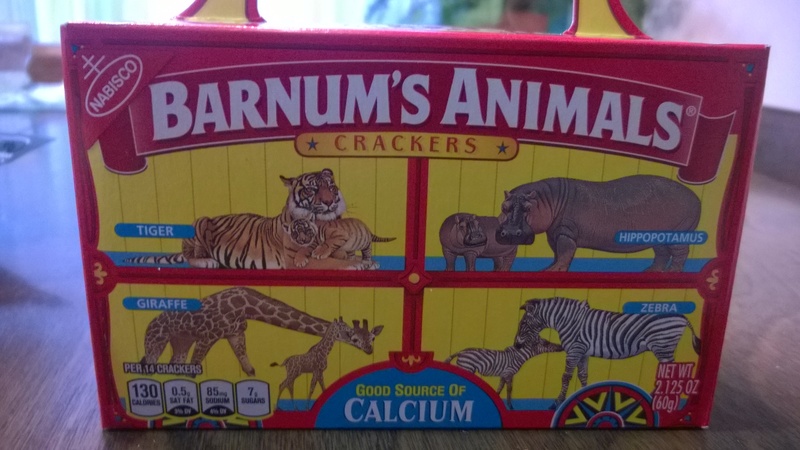 Animal crackers…in a little box…are still a pretty cool thing!! Although Oreo probably remain as my all time favorite! They’re my husband’s favorite too. A package of Oreos never lasts long in our house! Back in the mid 80s when my husband and I were dating during high school, he would meet me at lunch with a bag of M&Ms and a Coke, in a glass bottle. M&Ms are my all time favorite. I still love a cold Coke in a glass bottle. It’s so hard to find glass bottles anymore — I looked, because it would have been a perfect addition to my husband’s goodie bag, but no such luck. Oh well. Previous Previous post: Do French Women Catch Colds? Next Next post: BuzzFeed is Trying to Blow My Cover!